What Happened to Former Senator John Edwards? Where Is John Edwards Now? What Happened to Former Senator, John Edwards? Where Is John Edwards Now? The Internet is buzzing with the latest scandal surrounding President Trump. His personal lawyer, Michael Cohen, admitted to giving money to adult film actress Stormy Daniels, who once claimed she had an affair with Donald Trump. The incident is bringing back memories of Senator John Edwards’ 2011 indictment in a similar case. What happened to John Edwards? Where is John Edwards now? Keep reading to find out more! Former North Carolina Senator John Edwards was a vice-presidential nominee in 2004, who shocked America with his campaign scandal. He was accused of using campaign funds to conceal his mistress. Edwards was indicted in 2011 and accused of covering up an affair he had while running a presidential campaign in 2008. The indictment made waves in political circles and inflicted a major blow to Edwards’ political career. We’re revisiting the story right here, including information on what happened to John Edwards and where John Edwards is in 2018. John Edwards was the first person in his family to go to college. He graduated from law school with honors and began his career as a clerk for a federal judge in North Carolina. From these humble beginnings, Edwards worked in a law firm for several years before starting his own firm in 1993 in Raleigh, North Carolina. He was elected to the U.S. Senate in 1998. However, he announced his retirement from the Senate just before the 2004 election. In his stellar career, Edwards was a vice-presidential nominee in the 2004 election and even ran a campaign for president in 2008. His political career soon began to unravel when reports of an extramarital affair with former campaign worker, Rielle Hunter came to light. John Edwards’ affair with Rielle Hunter reportedly took place while his wife, Elizabeth Edwards, was dying of cancer. Hunter gave birth to Edwards’ daughter in 2008. He initially denied that he was the baby’s father, but later admitted that he was, indeed the father of the child. In 2011, Edwards’ reputation was further tarnished with an indictment. The former senator was charged with using campaign funds to conceal his relationship with his mistress from the public. The trial grabbed headlines in 2012. Edwards’ defense argued that most of the money was given as gifts by friends and was not entirely part of the campaign fund. He was eventually declared not guilty on one count. The remaining five counts were written off on account of a mistrial. Although the charges were dropped, Edwards’ political career took a significant beating, from which he never recovered. Also Read: Bristol Palin’s Instagram: Her 143K Followers Are Upset over the Split! Will Dakota Meyer and Palin File for a Divorce? Michael Cohen’s recent admission brings back memories of Edwards’ indictment. So now, everyone wants to know where John Edwards is today. The former senator is currently a personal injury lawyer in Pitt County, North Carolina. 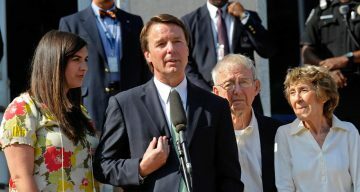 John Edwards’ wife passed away in December 2010. She legally separated from Edwards before her death.